This is my 300th post! Considering I post a recipe almost every time, and sometimes more than one per post, that’s gotta be nearly 300 recipes. Phew. I’m simultaneously giving myself a little pat on the back and wondering why I spend so much time on this! For my 300th post, I’ll talk about something simple and enduringly good. Potatoes. I love potatoes. I don’t remember always loving them, but in the last few years, I feel like I want to eat them every night! They’re so comforting, and versatile, and they have a wonderful, subtle flavor all their own, but they’re so generously accommodating to other flavors. I like them roasted – any size. Cut into large chunks and tossed with rosemary; cut into nice thin roasted slices; cut into tinsy pieces, and then roasted till they’re little crispy nuggets. I love them mashed. Mashed potatoes are as fun to play with as they are to eat. You can make mountains and moats and volcanoes, with little pools and rivulets of melted butter. I’m something of a mashed potato purist, (butter, salt, pepper) but tarragon-roasted garlic mashed potatoes are very nice, too. I crave french fries, sometimes. I don’t drink beer, very often, but sometimes I like the idea of going to a bar in the afternoon and having a big plate of french fries and a pint of beer. David and I have a small tradition of going into New York and finding a place to have french fries, hummus, and a glass of red wine. There’s nothing better after a day of walking and looking. I don’t have a deep fryer, but I oven-roast french fries from time to time. I like them with a savory vanilla sauce. It’s my tribute to fries and a vanilla milkshake. 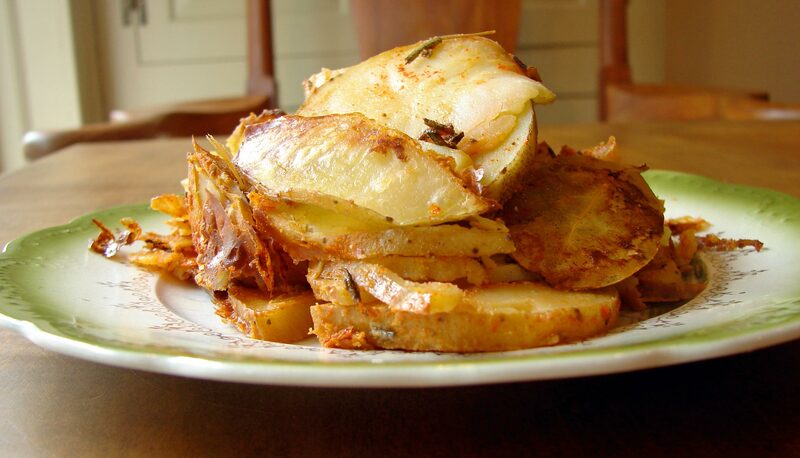 One of my favorite ways to eat potatoes is to slice them quite thin (1/4 inch-ish) parboil them, and then layer them in a dish with herbs, herb-infused milk, or butter, and bake them till they’re crispy on the outside and soft and flavorful on the inside. In this scenario, the possibilities are endless. You can use any herbs or spices that you like. You can always add cheese, if you’re in the mood. One elaborate version is this with sofrito and fennel. I’m going to suggest a few versions here, but your imagination and your taste are the limit. I’ve never heard this song before! Bob Marley sings Milkshake and Potato Chips!! How wonderful!